The PetCPR+ Certification program is our flagship program designed to teach the participant the fundamentals of canine and feline CPR and First Aid. This class is ideal for anyone who loves animals including animal professionals, obedience trainers, kennel staff, pet retailers, pet sitters, animal shelter staff/volunteers, rescue personnel, groomers, First Responders, Fire/EMT and pet owners. This course will provide an overview of what to do for a pet in an emergency situation prior to getting veterinary care. Curriculum for all classes is developed by licensed veterinary professionals using veterinary industry standard methods of emergency medical care. Although Pet Emergency Education teaches the most current industry standards for animal CPR, we are in no way affiliated with the RECOVER Initiative, its affiliated organizations or its RECOVER training programs. 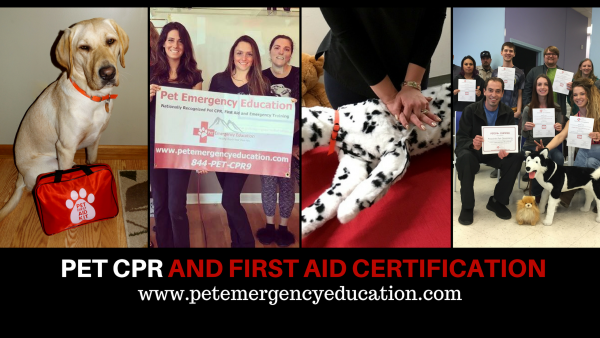 Would you like to host a PetCPR+ Certification Class? Classes are classroom style with no live animals being used. Instructors will bring professional animal CPR mannequins, anatomical models and utilize medical first aid supplies to teach the necessary skills. Class is 3 hours long and consists of lecture and hands on portions. Hosts will be required to provide the space, chairs, a table for the instructor and a blank wall for the instructor to display the presentation.